When you purchase a car, whether it is your 1st vehicle or your 5th to add to your collection, it is one of your prized possessions and should be treated as such. 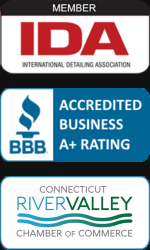 At M&M Auto Detailing, we know how important your car is and make it our business to provide the best possible Connecticut detailing services. Since 1996, we have strived to build a business on quality and excellence. Learn why Middletown residents make the trip to visit us in Glastonbury! The way we see it, your car is as important to us as it is to you! We take pride in methodically detailing your ride from bumper to bumper. Proper detailing is a process that cannot be rushed so we take our time to ensure we cover every aspect of your car. We offer deep interior detailing as well as a 7 step exterior detailing process that is unlike any other offered by competitors. A deep cleaning of every surface in your car! Your car’s exterior is just as important as the interior and we take it seriously. Our 7 step exterior detailing sweeps the entire car and will make it shine like a star. We hand wash the outside of your car, wipe down the door jams and gas tank area, as well as the tires. This process removes any contaminants that are on the exterior surface. Removes imperfections and scratches caused by acid rain or light oxidation with a clear coat. Removes swirls caused by buffing and levels out the paint. This is where your car’s exterior shines by leaving a clear coat clean and smooth. High quality wax is applied by hand to create a long lasting shine and protection that lasts up to 12 months. Extra layer of shine protection to end the detailing process. We promise to provide the best possible detailing service when it comes to detailing your car. From customer service to the actual process, we promise to leverage our years of experience to create an end product you can be proud of.